Looking for a fun way to review the number ten with your kiddos? Check out this creative Ten Frame Toss game created by Nicole over at Mrs. Ricca's Kindergarten! It's super simple to play and provides a great way to review. Students begin by shaking a cup full of ten two-color counters. Then they place the counters onto the colorful ten frame. 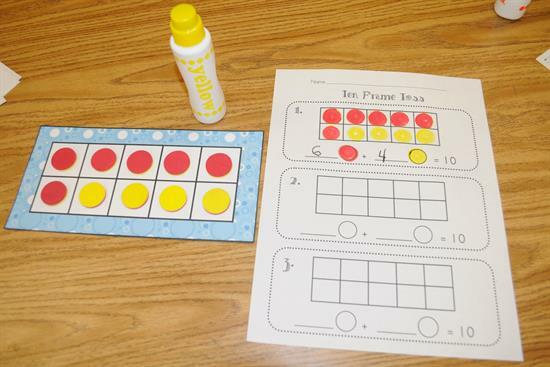 Using a Do-A-Dot marker (or crayons, markers, etc is you don't have Do-A-Dot markers) students record the results onto the provided worksheet. To finish they fill in the equation underneath the ten frame. For additional kindergarten ideas, be sure to head over to Mrs. Ricca's Kindergarten!